If you know of any additions, deletions, verifications, please contact us! 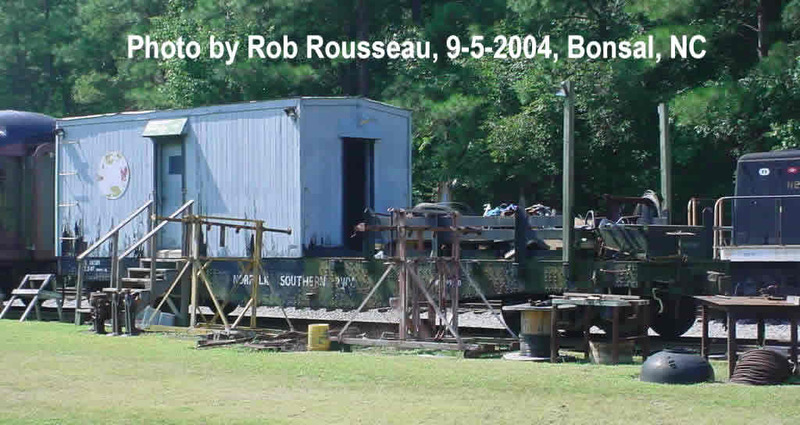 Bonsal, N.C., New Hope Valley Railway, a project of the East Carolina Chapter of the N.R.H.S. -- Norfolk Southern 701, GE builder #30013. Southern Rwy #701, to Naporano Iron & Metal (5/78); to LRS #110 (6/79) - This has been scrapped in 2010. 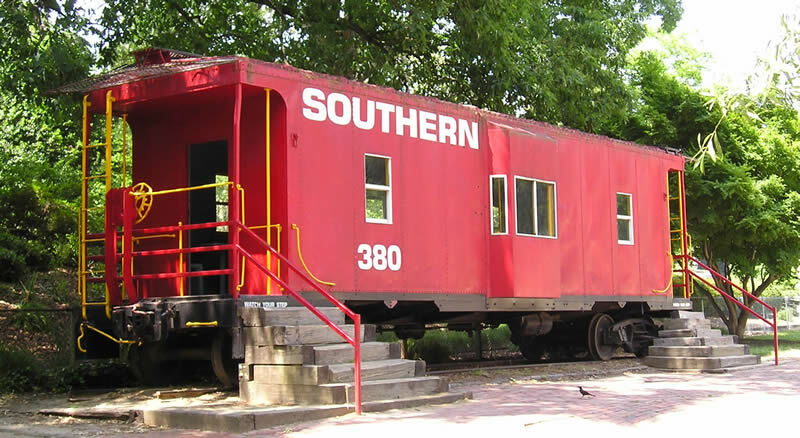 -- Norfolk Southern 380, bay window caboose, Southern Railway paint scheme at playground. Courtesy of T.L. -- Atlantic & Western 2-8-0 #12 (formerly Norfolk Southern 203), stored outside next to Railroad House. Courtesy of R.T.
-- Norfolk Southern 387, bay window caboose, in roundhouse This caboose was built from an old boxcar by the NS Railway in their shops in 1937. 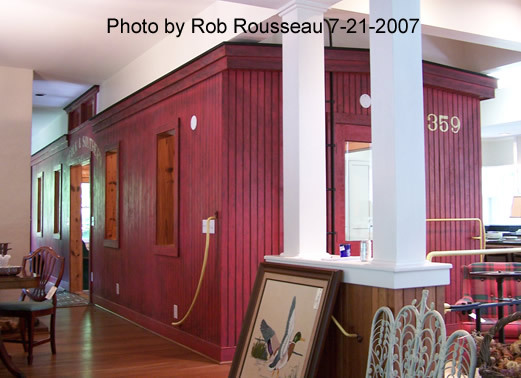 Some railroads converted their old thirty-six foot boxcars into cabooses for use by the train crew. 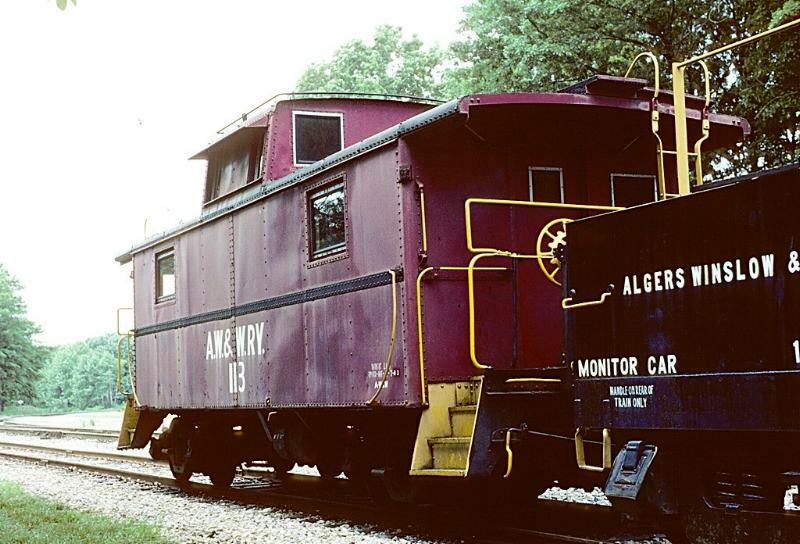 The sides were stripped to the frame, and in this case new sides and bay windows were fashioned so the crew could watch over the train while in route. Large windows allow easy visibility when going through curves. 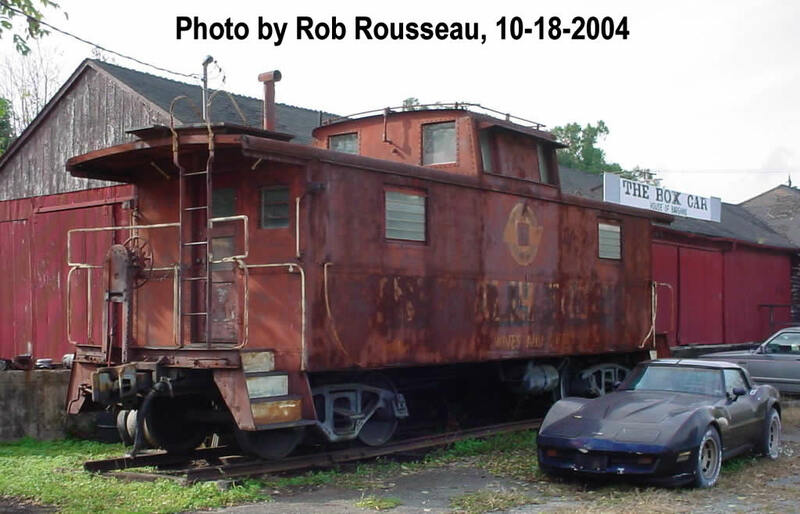 These cabooses were painted either a boxcar red or gray, depending on the decade. 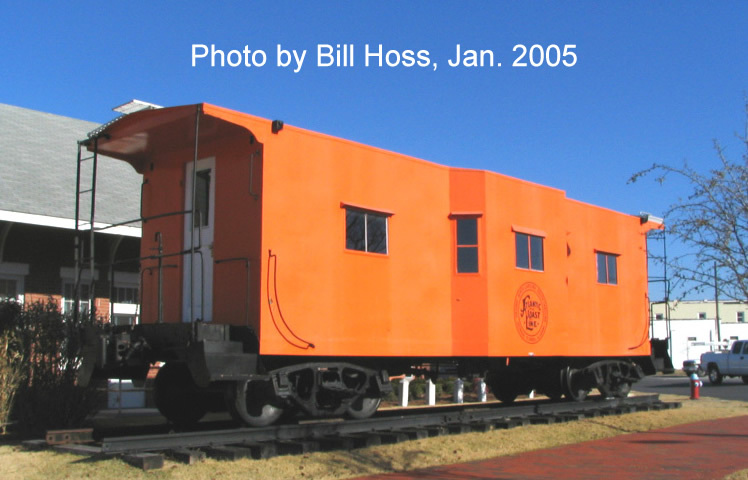 The caboose was donated to the Town of Spencer in 1976 and later to the State of North Carolina in 1986. It has been restored in the last paint scheme of gray with red stripes to match the NS diesel 1616 and is displayed in the Robert Julian Roundhouse. 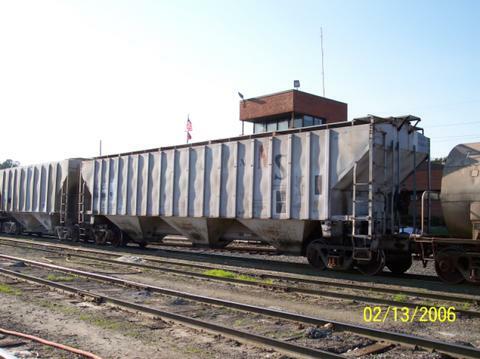 -- Norfolk Southern 911, maintenance-of-way camp car, stored outside adjacent to roundhouse. This car was built in 1943 by the Pullman Company as a US Army troop sleeper. 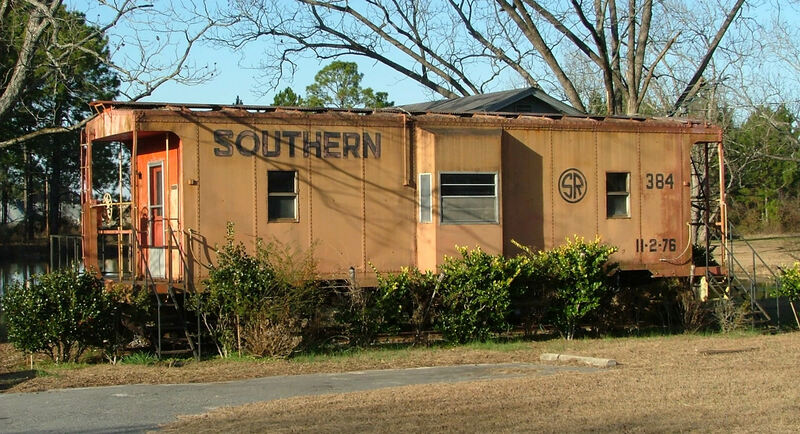 Norfolk Southern purchased the car after World War II and used it in maintenance-of-way service for work crews. Norfolk Southern Corporation donated the car to the State of North Carolina in 1979 and is occasionally used by volunteers working over the weekend. (Stored on the property, not on display). -- Norfolk Southern 1616, diesel locomotive, in roundhouse This non-operating locomotive was built by the Baldwin Locomotive Works in 1955. 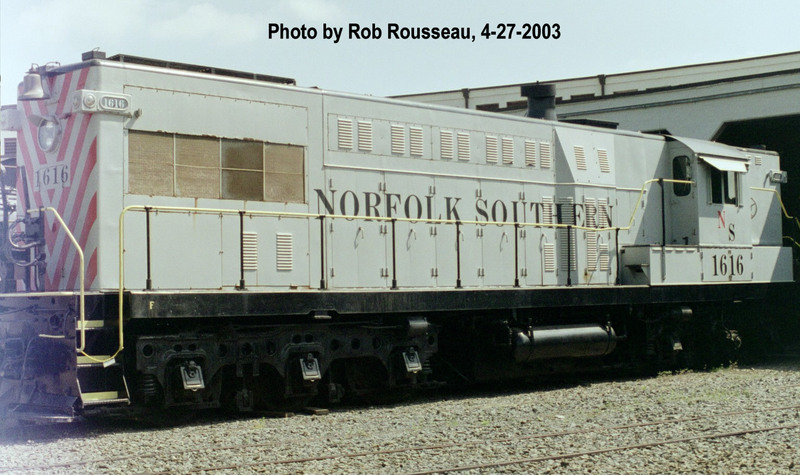 The AS-416 is one of several that were ordered by the original Norfolk Southern Railway. The 1616 has electrical components supplied by General Electric. The original NS ran from Charlotte, NC through Raleigh to Norfolk, VA. Early dieselization used Baldwins and General Electric 70-tonners. Later they bought EMD GP-18s. 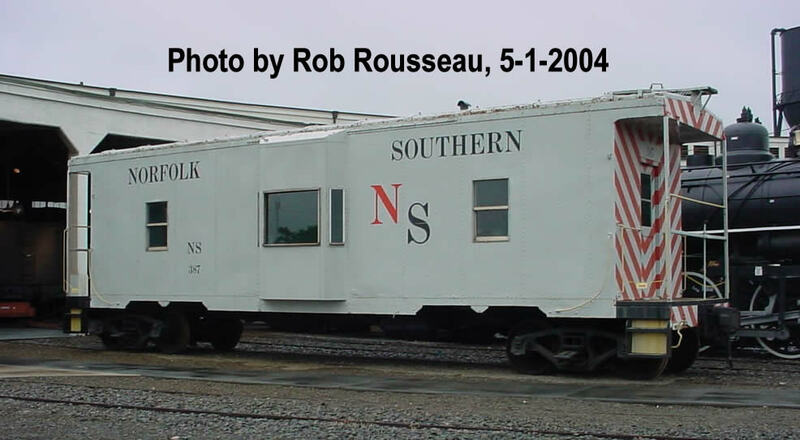 The Southern Railway merged the NS Railway into the system in 1974, and after the N&W merger in 1982, used the name in part for the new corporation. After 1974, Southern sold all the remaining Baldwin locomotives, and the 1616 went to the Peabody Coal Company in Lentzburg, Ill. 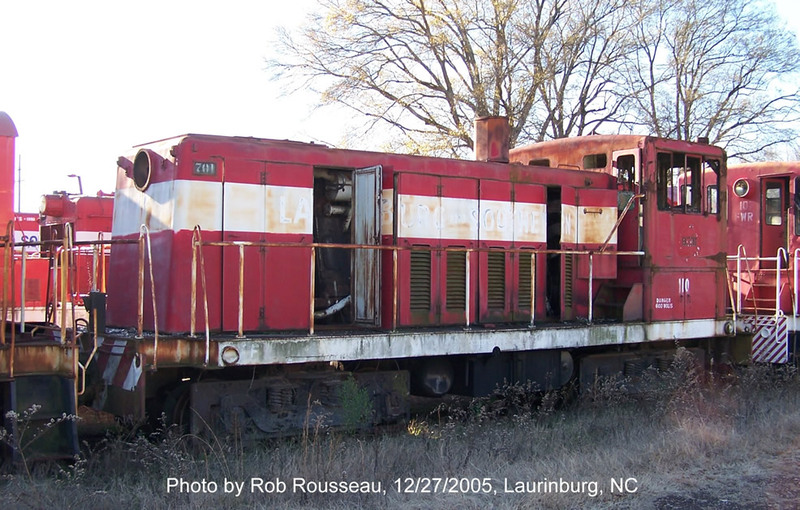 They donated the engine to the State of North Carolina in 1981, and volunteers restored the locomotive to its late 1950s early 1960s appearance. It is now on display in the Robert Julian Roundhouse. NS 2002 was the first unit rebuilt by the Knoxville Locomotive Work. 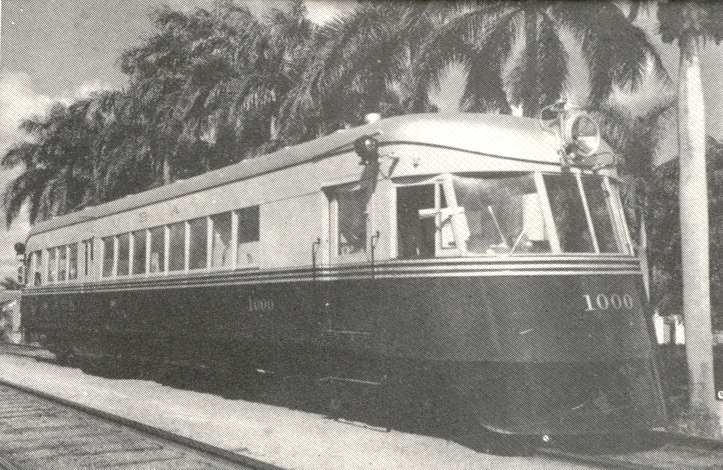 The unit had been out of service on the Gulf & Ohio Railways. The locomotive received KLW20B prime mover." -- NS 50' boxcar used as MOW storage shed at GFRR posted to Facebook on June 2nd, 2013. Covered hoppers (Most of these were from a group of 150 cars numbered 5300-5449, built in 1973. The last of new cars to be bought by the independent NS. Bought for phosphate service on the Lee Creek Branch. From ORERs, it shows that the Southern eventually renumbered them into a 90850-90999 pool (supported by NS 5405->SOU 90920->PLCX 16688). The 1975 ORER lists 105 still lettered for NS, then the numbers dwindle in 1977 - 80, 1979 - 46, 1980 - 26, 1981 - 18, 1983 - 16. This last numbering scheme would support PLCX range 16621-16765. By the 1989 ORER, it showed PLCX having 145 of these and SOU - zero. -- PLCX 16885, in Marion, NE on 05/15/2008, ex-SOU 90917 and again 5 miles later in Cedar Bluffs, KS. -- NS 2002, x-SOU 2881, x-NS 2881 (until 1996), now Georgia and Florida Railway (GFRR) 2881, Albany, GA (unverified). -- Norfolk Southern 2, GP-18, at ex-Otter Tail Valley Railroad (OTVR) 181, ex-SOU 181, ex-NS 181 now DLCX 181 on the Burlington Junction Railway in Burlington, Iowa. 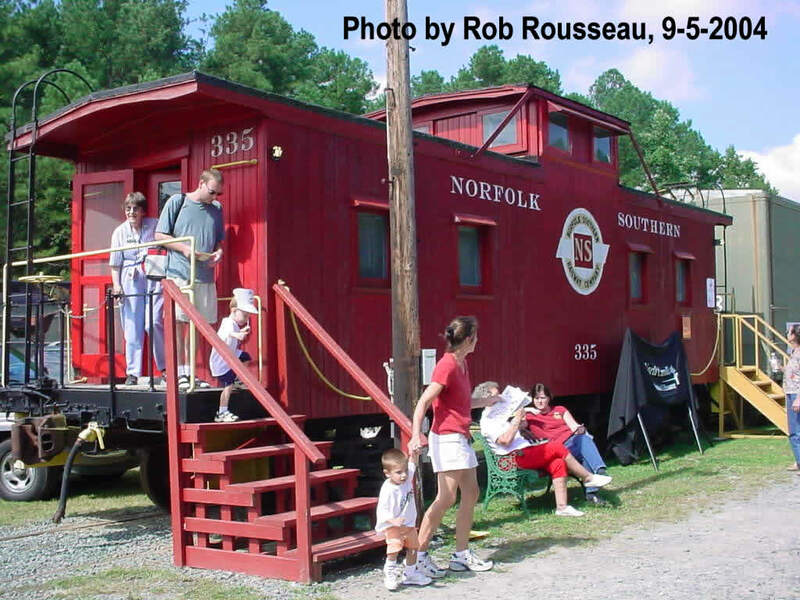 Dallas          NC     NS 389        as SOU X389, steel, bay window, built from boxcar, Depot next to library. 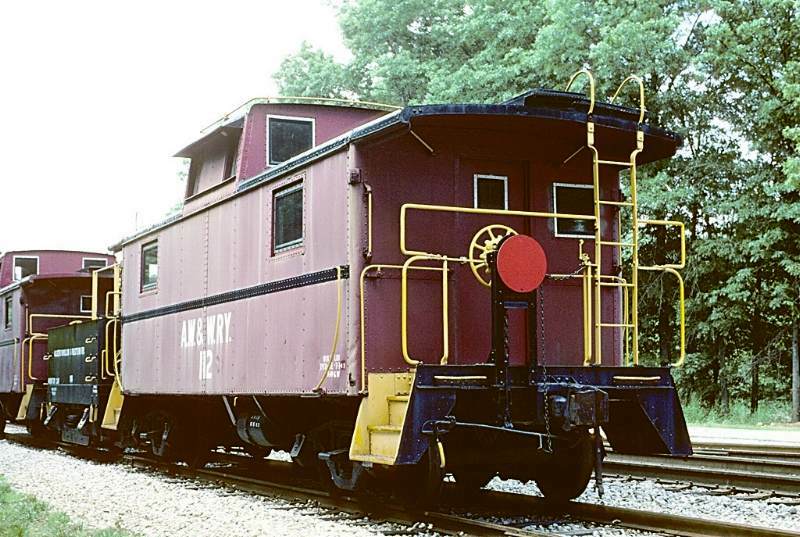 -- NS 332, wood cupola caboose in private ownership, Decatur, TN. Relocated from Landrum, SC in 2011. 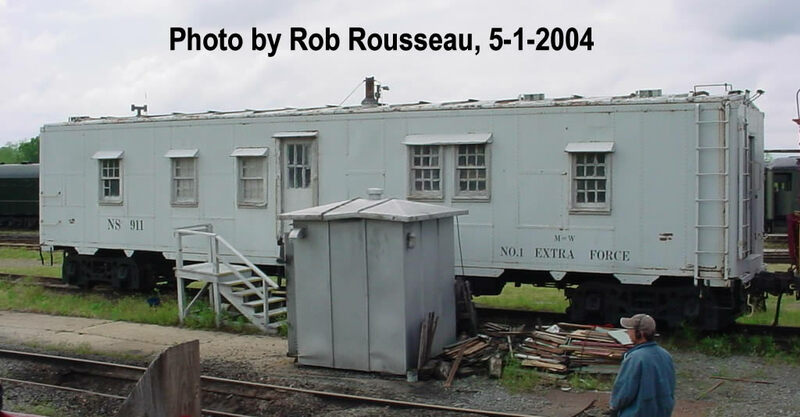 -- NS 373, steel cupola caboose built by Magor, up in New Jersey used as an office on NJT. 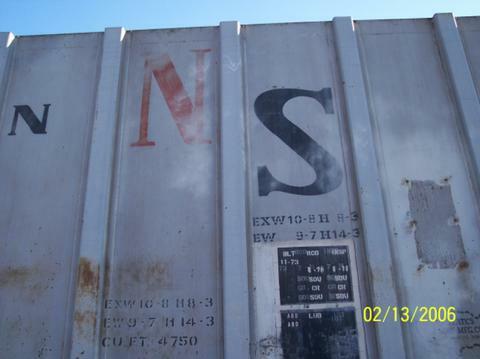 -- NS 375, steel cupola caboose built by Magor, for sale, Alabama, ex-SOU X-257. 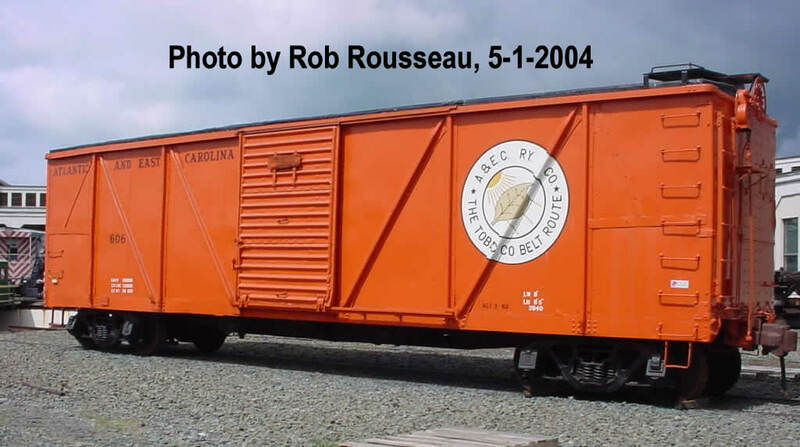 -- Covered Hopper, PLCX 16669, Raleigh, NC on February 13, 2006 & NS Lettering on it - Photos courtesy of D.Y.